Containing quality ingredients, this Monin 750 mL premium coconut flavoring syrup is a quick and easy way to add new flavors to a variety of recipes! Add a splash of this coconut syrup to your most popular beverages and it's sure to please your guests. The rich, tropical taste of this flavoring syrup will enhance the fruity profile of your mixed or blended drinks without overpowering them or being too sweet. Plus, it's produced with pure cane sugar and no artificial flavors, making it an all-natural syrup with a balanced blend of flavor and aroma that will instantly upgrade your coffees, smoothies, and shakes. Powerful flavoring with this coconut syrup. This is a great addition to mochas, lattes, and especially Italian sodas. The quality is great and the flavor is true. Monin coconut is a really great flavor to have. It pairs well with mocha and or almond. It also has cane sugar instead of corn syrup. Monin has been our favorite brand to work with for our specialty coffees and teas they are perfect for mixing with our lattes or just sweetening regular coffee. They don’t taste artificial and are all natural. Coconut is delicious! It is hard to find a coconut flavoring that tastes legit and not like a artificial syrup. Monin did a really good job with this coconut it tastes very real. We use this syrup for drink mixes and it is perfect. It's plenty sweet so we don't have to add any simple syrup or any sweeteners. Have used Monin brand for years now and it's always great! Premium! Premium is the key word in the description of this product. Great in blended drinks, not overpowering or too sweet. It has a very authentic tropical taste. Yum! At my coffee shop, I mix this flavor with dark chocolate to create a delicious latte. Customers love it, and it's personally one of my favorite syrup flavors. Coconut gets used up more quickly than anything else in my home, because it goes with EVERYTHING! Peach, raspberry, pineapple, guava, watermelon, blue curaçao, you name it. Buy LOTS! Monin is the most natural, most flavorful syrup on the market. Just smelling the coconut makes you feel like you should be on the beach and the taste is amazing. I love the coconut syrup for making our coconut ice cream at our sweet's shop. The coconut flavoring is terrific and really authentic in its taste. The premium coconut flavoring syrup is great and really has a nice, fresh coconut taste. The syrup is great for making our chocolate, coconut milk shakes. This is a perfect coconut flavor. I use this with the chocolate flavor syrup to make an almond joy latte. I have even put a 1/4 in pineapple yogurt to make a pina colada! I am a huge fan of coconut and love the great, tropical flair of this syrup. Very please to have tried it and now I am in love. Great way to make coconut lemonade or tea. I have used this for my coffee for years. I love the taste. I was very pleased to see that the expiration date was May 18 2020. Just the fact that I don’t ever worry that anything I buy will be out dated is more then enough reason to come back time and time again. High quality product that every bar should be stocked with at all times! I ordered a few because the price was so reasonable and even with shipping it was still priced lower than any other retail store! We use many different flavoring depending on what we are making or their use. This is another that, I would only use for Coffee's. It's not that is bad, The coconut is subtle which makes it better for coffees. So great to find a realistic tasting coconut syrup that makes the best coconut cream cheese spread. Amazing between our pineapple bagels and so yummy. So far I have tried this in 4 different kinds of drinks. I have to say that the flavor is really smooth and you only have to use a little bit of this stuff as it really goes a long way. I am so glad that I found it. It beats the generic brand that our stores carry! We really like this flavor, tastes pretty true, we tasted a lot of different flavors to find the best we could, and this one made the cut. Love using the coconut syrup to make our coconut cream pie shakes. The coconut flavoring is legit and tastes super fresh. You will love this syrup. A nice coconut taste and great to make our coconut martini. Love the smooth nature of the taste. Can not wait to try more recipes. I had never thought about using this coconut syrup in my coffee until a friend mentioned trying it. I love it. The flavor is great and it pairs well with my coffee. So delicious. this has now become my favorite coconut flavoring syrup that I use every day. It is really good and it has all kinds of different uses. A nice tropical inspired flavoring syrup in the wonderful taste of coconut. A great way to make deliciously flavored coffees for my friends in no time. A nice coconut flavored syrup that is great for making coconut frostings. It is delicious in coffee and for making specialty cafe style drinks and mochas. After using the Monin brand, I was confident that my sister would love the coconut syrup as a gift. She is all about coconut everything! She loved it and has been using the syrup in her coffee. She also has made a coconut cake with it too! The Monin coconut flavoring syrup is a great tropical themed syrup that will be a game changer at your next party. The flavor is great and wonderful for making daiquiris. We love monin coconut syrup! Our customers love adding this to different types of drinks. It is always good in a mocha, latte, frappes, and even just plain coffee. The coconut syrup is very good, unlike some of the other Monin syrups it is a very strong flavor so a little goes a long way. Coconut Monin syrup has a rich and perfect flavor for your mock-tail cocktail, tea or soda. Cherry Monin syrup is the right choice for you because it gives a perfect sweetness and true flavor for your mixed drinks. I really love the coconut syrup for my coffee. A lady at work had to me about the syrup and I was skeptical. I thought there is no way that coconut is good in your coffee. Boy was I wrong. This is one of the best flavorings I have ever added to my cup of joe. I highly recommend giving it a try. The monin coconut syrup makes some of the best tasting pina colada drinks ever. We use this very often in our store as it is a customer favorite. I bought this syrup to make piño colada, but I also frequently enjoy it in my ice cream. It is also great drizzled over diced pinaaple. The coconut flavor is subtle and slightly floral. We were tired of using the syrups we had been making drinks with for years for one reason. Monin... When it comes to coconut based drinks, look no further. Its a better and healthier choice you'll be happy you made. This is my all time favorite Brand for the Coconut! It has a very strong aroma and taste!!!! You can not beat it with any other brand I will never buy another! This is a must buy if you like coconut! This makes a very delicious pina colada frozen drink. It is also great our cold and hot coffee drink and frozen frappes. And it smells so good. One of the surprisingly popular flavors at our small town coffee shop. Goes great on its own, or mix it with chocolate for a decadent Coconut Mocha. We also used it in a Pina Colada smoothie last summer that was really popular. Great price on all Monin! We love the fact they carry Monin syrups! These are some of the best flavors we've found so far and use them daily for coffee drinks. Do you like Pina colada? 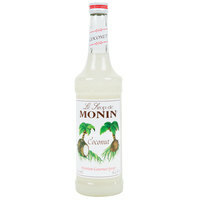 Than you need this coconut flavoring syrup from Monin. Nice creamy texture with smooth coconut flavor. Great choice for any bar. The Monin flavoring syrups are tasty, maybe too tasty. You'll want to try them all. This coconut one enhances various treats. It's good for adding coconut flavor to drinks and baking recipes. I had an iced latte made with this syrup at a coffee shop and it was to-die-for, so of course I had to purchase my own bottle! It has a sweet, candied coconut taste, not at all flavored like sunscreen. It adds a very nice creamy and slightly tropical taste to your iced coffees or lattes. I usually buy sugar-free, but there's nothing that quite matches this awesomeness. It's really yummy, smells delicious, and is the perfect indulgence! Monin syrups are great. The flavors taste great, are of high quality and most are GMO free. Our customers love the quality and taste! We planned to drop this flavor after summer but our customers still ask for it. We ordered six flavors of Monin syrup for a welcome dinner at our wedding, and they were all a hit with kids and adults. The bottles arrived very well packaged. Some of the shipping stickers were a pain to take off - they were covering the flavor of the syrup - but gentle pulling removed them without too much damage to the label. People seemed to use/prefer less syrup than we expected, and less than the 4 pumps per drink that Monin recommends, so we have plenty of extra after an evening with about 60 people. Coconut was one of our more strange flavorings (we stayed pretty classic) but people enjoyed it for combining with other flavors. People don't always think of coconut for their coffee, but it is sooo good! And Monin syrups are the best and Webstaurant has the lowest prices on syrups. We really like monin syrup the best because we feel like they are top quality. This is do good mixed with caramel and espresso. Our customers love it!! We use these in our cafe to flavor coffee & latte's, excellent choice. Great flavor & you can't beat the price especially if you order with mix & match. This coconut syrup is great quality and makes our cafe drinks delicious. It has a long shelf life and doesn't spoil. Monin is a great company.